A suicide truck bombing in the restive Iraqi city of Ramadi has killed at least 20 people, police say.A police commander in Ramadi said a police checkpoint had been targeted. Elsewhere, police said clashes had erupted between US and Iraqi forces and fighters from the Shia Mehdi Army militia in the city of Diwaniya. A ban on vehicles has been imposed on the city following a raid by security forces at about 0500 (0100 GMT), police sources in the southern city said. A number of American vehicles have been destroyed in the fighting, police sources told the BBC. There have been a series of sectarian killings in Diwaniya – which is 180km (110 miles) south of Baghdad – in recent days, a source in the governor’s office said. A police commander in Ramadi said the truck had been driven into a police checkpoint in the western part of the city and the bomb detonated. There are reports that several policemen were killed. Thirty people have been reported injured. The bombing was in a densely populated district and there are fears many of the casualties are civilians. Some reports said the bomb had released chlorine gas. 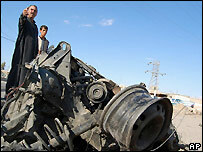 There have been 10 bombings in Anbar province this year using chlorine gas as a weapon. Ramadi has been a centre of the Sunni-led insurgency against coalition forces and the Iraqi government.